My Grandmother!… You know I got on the highway there for a minute and I just remembered Grammy is still driving… Grammy’s 85 (I just wanted to brace you). She only drives in Central Maine so if you’re away from that area you’re probably safe. Grammy’s got an old Buick, about a ’47 Buick, big heavy lotsa Detroit steel. Grammy was out driving the other day and Grammy’s got lotsa blue hair, and she’s got 3 blue-haired buddies that hang around with her. I think it’s a cult. Grammy had that big Buick whistlin’ down the highway the other day and the blue light come on behind the car and Grammy pulled right over to the side of the road. The trooper come up and rapped on the door, and Grammy put the window down and said “What is it officer?”. Written and contributed by Gary Crocker. Listen to this and other humor samples at GaryCrocker.com. 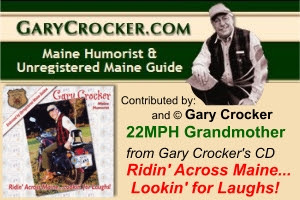 Note: Gary Crocker is a Maine humorist and entertainer who has performed on stage and at private corporate events throughout New England and across the country in such places as San Francisco, Dallas, Orlando, Chicago, and SpearFish… South Dakota. View his schedule of live performances from his home page, or purchase Gary Crocker CDs on sale here.